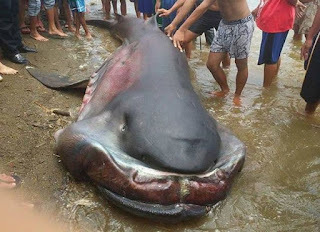 Imagine the shocked faces on Philippines Tourist Beaches when this gigantic shark weighing 2 tons washed ashore at the resort and fishing town of Barangay Marigondon! Holiday makers witnesses this rare and strange and gigantic sea monster after it was trapped in fishermen’s nets in shallow waters close to the shoreline. This huge shark normally inhabits very deep water and has rarely been seen by anyone, in fact there have been less than seventy sightings of the shark ever. This shark is actually quite harmless and does not even have full size teeth as its feeds on plankton and other small sea creatures but it is easy to understand why bathers would be shocked and scared when the saw this huge shape in the water on a short distance from where they were swimming. This species is so rare that it was only actually discovered in 1976, it can grow to 17 feet in length and scientists say it can live to be over 100 years old. 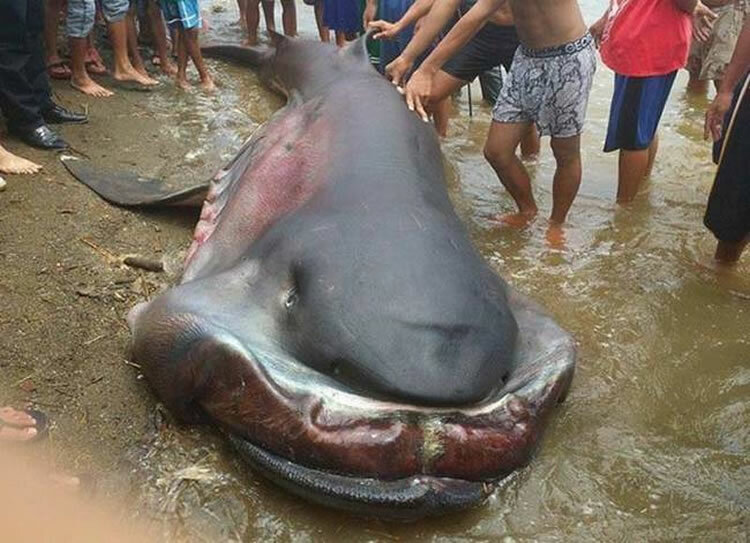 What exactly caused the death of this shark is as yet unknown but the body has been donated to the Philippines department of fisheries who hope to find out what the cause of death is and also to study the shark which is until now virtually unknown by most of the world. With animals as big as this only recently being discovered it bares though a to what else might be living in the depths of our oceans that are still undiscovered, as technology for deep sea craft improves we may yet find more gigantic monsters in the depths. What would you do if you saw one of these struggling in shallow water? Try to help it or run for your lives?